The Fender Modern Player Telecaster Plus is one of the most uncommon Telecasters we've ever seen at Remix. At first glance, this unusual axe looks like a custom-shop creation. Not only is its unique pine body super lightweight and comfortable, but it also gives you a light and airy tone. To get the most out of this tone, Fender gave the Modern Player Telecaster Plus a singular set of pickups, including a traditional Tele-style neck pickup, a Stratocaster-style middle pickup, and a humbucker at the bridge. What's more, you also get a Strat-style hardtail bridge to lock down your tone. If you're looking for a huge range of tone, then you need a Fender Modern Player Telecaster Plus. Not only does the Modern Player Telecaster Plus feature an HSS pickup configuration, but it also sports two different single-coil pickups. That means you can get the liquid Tele lead tones you love, plus classic Strat midrange bite. What's more, the Modern Player Telecaster Plus's humbucking bridge pickup features a mini toggle coil split switch, giving you an even wider range of tone. Incredible tonewood combination As classic as it gets! The Modern Player Telecaster Plus features Fender's original Tele wood combination, bringing together the sweet sound of a pine body with the snap and spank of a maple neck and fingerboard. Not only does this make the Modern Player Telecaster Plus incredibly comfortable to play, but it also provides you with that quintessential Tele tone. Rock-solid Strat-style bridge To top it all off, Fender decided to give the Modern Player Telecaster Plus a modern Stratocaster bridge. This bridge features a 6-saddle hardtail configuration, which lets you perfectly tune your axe. The Modern Player Telecaster Plus gives you the extra-tight sonics of a string-through-body tailpiece, providing you with extra sustain. 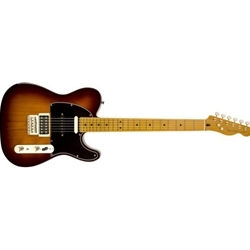 The Fender Modern Player Telecaster Plus solidbody electric guitar gives you classic Tele tone with modern flexibility!